Classroom questions have traditionally focussed on testing the recall, understanding and application of content and methods. Research suggests that pupils require activities that encourage them to think flexibly about possibilities and to make independent judgements about information. 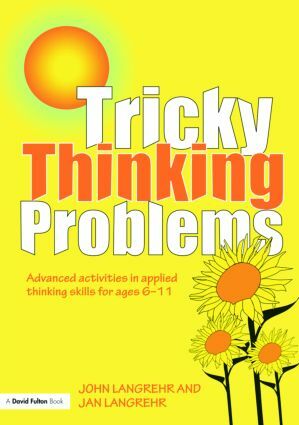 Tricky Thinking Problems explores the advancement of creative and critical thinking, and the activities are designed to help pupils test and develop such processes. A series of fascinating challenges are used to stimulate cognitive organisation in areas such as categories, similarities, differences, ordering, analysing, predicting and many more. Pupils will enjoy developing their range of different thinking skills as they complete the resources based on topics such as animals, weather, communications and food. Rather than being told which particular thinking skill to use, the questions are designed to encourage pupils to pick and choose a range of skills and apply them creatively. The resources are fully photocopiable and are suitable for 6 -11 year olds.